A man's home is his castle; in Sir Henry Pellatt's case, it was Casa Loma. Built between 1911 and 1914, it was ó and still is ó the grandest residence ever constructed in Canada. With 98 rooms, it was conceived on a scale that dwarfed everything else around it. 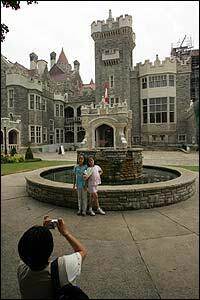 These days Casa Loma is one of Toronto's most popular tourist attractions. Since the city took over Pellatt's castle for non-payment of taxes and handed it over the Kiwanis Club in 1936, little has changed at the "house on the hill" above Spadina Rd. Now people are beginning to wonder if the Kiwanis Club is the best choice to run Casa Loma. The well-intentioned service club uses its portion of the profit to support charitable projects, but many feel that it has failed to take advantage of the place.Last year a special committee was formed to examine the situation. It will present its report to City Council this fall. But from the beginning, Torontonians have been ambivalent, even hostile, about Pellatt, his boundless ambition and his famous folly. When the business empire he created collapsed in the early 1920s, they smirked and rubbed their hands in glee. After Pellatt was forced to abandon Casa Loma in 1924, the contents of his castle were auctioned off in a manner apparently calculated for maximum humiliation. Casa Loma is one of Toronto's top tourist attractions, drawing about 400,000 people a year most of them out-of-town visitors. The city is spending millions of dollars on a restoration program, and now a special panel is taking a harder look at how the 90-year-old structure is managed and maintained. The sale, described at the time as "the auction of the century," lasted a full four days. Property that Pellatt had collected at a cost of $1.5 million was sold for $131,600. Torontonians couldn't have been more delighted. What Torontonians chose to overlook was that Pellatt brought them kicking and screaming into the 20th century. It was Pellatt who pioneered hydroelectric power in Canada and who laid out much of the public transit system what would become the TTC. But even after Pellatt was gone, his castle remained. The city had no idea of what to do with it. Various schemes were tried and failed until, finally, in 1936 the Kiwanis Club took over. Already the building was falling into disrepair and the club spent a year whipping the place into shape. When it opened to the public in '37, it was an instant hit. The deal worked out calls for the Kiwanis to operate the facility and maintain the interior. The city, which owns the building, is responsible for the exterior. Under the terms of the agreement, the city receives 32.5 per cent of the box office and 7 per cent of other revenues ó about $1 million annually. But lately there have been signs of trouble. By the `90s, the exterior of the castle was literally falling apart and there was a feeling it was growing a little tired. Then, last year, the Casa Loma Advisory Committee (CLAC) was struck. "The city has viewed Casa Loma simply as a cash cow," says CLAC chair Ron Kanter, a Toronto lawyer and former MPP. "We're saying that the castle has been neglected for too long. There are varying views of what to do but many think it could be better. There are many ways of adding to the tourist experience. The Kiwanis is doing what the city asked them to do, but the city should be asked to do more. The city really should be doing a better job with sites like Casa Loma, but running a historic site is a challenge. We intend to propose changes to improve the operation and draw of the castle." According to architect Charles Hazell, who has headed the ongoing restoration of the crumbling castle since 1997, the building was in terrible shape when work began seven years ago. "Some sections are so damaged you can push them over with your hands," observes Hazell, crumbling bits of the exterior with his fingers. "There was danger of imminent collapse. After our first inspection, we put up caution tape immediately. It's amazing nobody was hurt by falling debris." As Hazell explains, the problems with the exterior go back to the 1980s when, to delay proper maintenance, the city had the outside walls coated and painted over. This had the effect of trapping moisture inside the blocks. It froze, expanded and burst the cast stone to pieces. "Pellatt's architect, E.J. Lennox, used a product called Roman Stone, a precursor of precast concrete," Hazell says. "It was a type of solidified mortar. It was superb at handling our climate and it can be carved. The problems happened because it was coated with Portland cement and latex paint. You can see in the areas that weren't touched the Roman Stone is doing just fine." Ever the entrepreneur, Pellatt had seen Roman Stone in the U.S. and hoped to introduce it to Canada as a building material of the future. Whatever other intentions he had for Casa Loma, it was also to be a showcase of this new technology. "It is a lovely material," Hazell insists. "But we wrecked it." So far, the main entrance, with its porte cochËre and enormous bay window, has been fully restored. Even the lead muntin bars that hold the glass panes in place are now in pristine condition. Recently, the scaffolding was moved west and work started on the veranda and the faÁade north of the Norman Tower. The restoration is a phased operation; eight stages, which add up to about 40 per cent of the building, are complete and three stages remain to be done. Inside, the story is altogether different. Though there are few obvious signs of decay, there are also few signs of authenticity. The Great Hall, for instance, has been altered, unsympathetically, to accommodate amenities such as washrooms, stairwells and ticket booths. Though the grandeur of Pellatt's vision survives intact, the details are less visible. The furnishings are long gone, of course, and Casa Loma staff hopes to fill the rooms eventually with "period-appropriate" replacements. But that's a long, slow, expensive process and money isn't exactly flowing. "We do what we can," says Casa Loma CEO Virginia Cooper, who presides over 22 full-time and 50 part-time staff. "The remarkable part is that we have managed to retain our position" among Toronto's most popular tourist attractions, she says. As is the case with every local tourist attraction, Casa Loma is still recovering from the SARS debacle. That year, 2003, marked the first time since 1937 that the Kiwanis didn't make a profit on the castle. In fact, it recorded a $400,000 deficit. Last year, the attraction made a modest surplus of $250,000. Most of Cooper's time is spent trying to make sure the place is always busy. Between 350,000 and 400,000 visitors show up annually ó 45 per cent from the U.S. Another 20 per cent are from other countries and 20 per cent are Canadians from outside the GTA. The rest are from the city. But therein lies one of Casa Loma's most enduring dilemmas: How to get Torontonians into the place. The city's culture director, Rita Davies, argues that the people of Toronto "have strong emotional ties to the castle." But the figures don't bear her out. "Quite a lot of tourists come here specifically to see Casa Loma," Cooper claims, "especially from the States." Beyond that, she says, there are "tiny niche markets, but they're not large in volume." That translates into 100 weddings yearly, 40 days of film-shooting, Christmas and March Break events and occasional bar mitzvahs, bat mitzvahs, wine-tastings, concerts and so on. "On average, we're booked 190 nights a year," Cooper says. "We're fairly proud of what we're doing here." Still, there's no question Casa Loma has suffered various indignities over the decades. The egregious two-storey concrete parking garage, for instance, built just west of the castle in the 1980s where gardens used to be, is a blight on the landscape. Inside, some of the artefacts, such the very dubious suits of armour, are an embarrassment. And the architectural drawings by E.J. Lennox on the second floor have faded almost to nothing. The large Druxy's sign doesn't add much to the ambience, and neither do the stand-up fans that make do in the absence of air conditioning. Regardless, the castle is crammed with visitors from all over: Japanese tourists with their cameras flashing, overweight men in Stetsons and bored children speaking French. "Frankly, there have been years when things were not kept up," Davies admits. "We went to city council in 2003 and said, `We need to commit capital resources or shut Casa Loma down.' Council committed $20 million over 10 years. And now the money we receive from the lease agreement will be put back into the building." As Hazell rightly points out, "The city has never really figured out what to do with Casa Loma. It's a cultural enigma, a bourgeois extravagance that didn't fit in with the sober reality of the city." "But," he adds, "we're making progress; now is our best opportunity to recognize the cultural significance of Casa Loma." Like the building itself, it's hard to miss.